Google Maps today announced the availability of new "wheelchair accessible" routes in its transit navigation directions for several cities around the world, recognizing that using trains and buses can present challenges for people who use wheelchairs or have other mobility needs. Information about which stations and routes are wheelchair friendly isn't always readily available or easy to find. To make public transit work for everyone, today we're introducing "wheelchair accessible" routes in transit navigation to make getting around easier for those with mobility needs. To access the new "wheelchair accessible" routes in the Google Maps app, enter a desired destination, tap Directions, select the public transportation icon, and then tap Options. 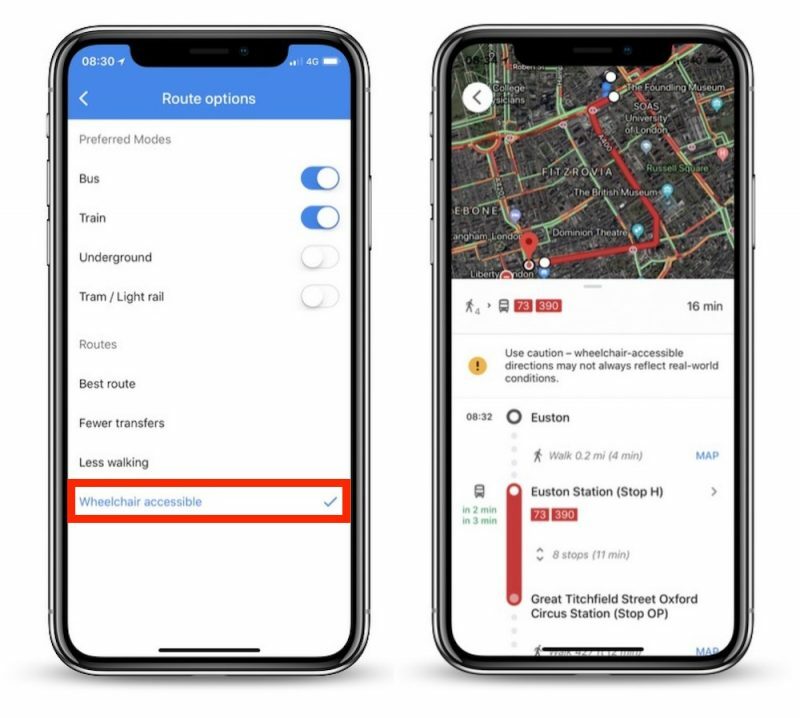 The new route type can be found under the Routes section. After selecting the "wheelchair accessible" option, Maps' directions list routes that take mobility needs into consideration, such as if a transit station has accessible stops, platforms, entrances, and exits. In addition to the new feature, Google has been updating its Street View imagery of transit stations and city centers to allow users to preview locations ahead of time. Google says it hopes the expanded coverage will make life easier not only for people who use wheelchairs, but also for anyone who's using crutches or pushing a stroller. Google Maps added Disneyland, Apple Maps fanboys mocked. Google Maps added wheelchair routes, Apple Maps doesn't have even cycling directions and routes. Apple Maps are getting obsolete faster and faster. Fantastic addition for Google Maps, that will help millions of people around, what ever OS they use. Great addition to an already fantastic map app.